Tales from the Crypt is a 1972 British horror film, directed by Freddie Francis. It is an anthology film consisting of five separate segments, based on stories from EC Comics. Only two of the stories, however, are actually from EC's Tales from the Crypt. The reason for this, according to Creepy founding editor Russ Jones, is that producer Milton Subotsky did not own a run of the original EC comic book but instead adapted the movie from the two paperback reprints given to him by Jones. The movie was one of many Amicus horror anthologies made during the 1970s and features an all star cast, including Joan Collins, Peter Cushing, Richard Greene, and Roy Dotrice, with Ralph Richardson as the Crypt Keeper. The story "Wish You Were Here" was reprinted in the paperback collection The Vault of Horror (Ballantine, 1965). The other four stories in the movie were among the eight stories reprinted in Tales from the Crypt (Ballantine, 1964). It was produced by Amicus Productions and filmed at Shepperton Studios. In the film, five strangers encounter the mysterious Crypt Keeper (Ralph Richardson) in a crypt, and he tells each in turn the manner of their death. Richardson's hooded Crypt Keeper, more sombre than the EC original (as illustrated by Al Feldstein and Jack Davis), has a monk-like appearance and resembles EC's GhouLunatics. In the EC horror comics, the other horror hosts (the Old Witch and the Vault Keeper) wore hoods, while the Crypt Keeper did not. The screenplay was adapted into a tie-in novel by Jack Oleck, Tales from the Crypt (Bantam, 1972). Oleck, who wrote the novel Messalina (1950), also scripted for EC's Picto-Fiction titles, Crime Illustrated, Shock Illustrated and Terror Illustrated. A sequel, The Vault of Horror, with a tie-in also written by Oleck, was released in 1973. Five strangers go with a tourist group to view old catacombs. They do not realise that they are all dead. Separated from the main group, they find themselves in a room with the mysterious Crypt Keeper (Ralph Richardson), who details how each of the strangers have died. After Joanne Clayton (Joan Collins) kills her husband (Martin Boddey) on Christmas Eve, she prepares to hide his body but hears a radio announcement stating that a homicidal maniac (Oliver MacGreevy) is on the loose. She sees the killer (who is dressed in a Santa Claus costume) outside her house but cannot call the police without exposing her own crimes. Believing the maniac to be Santa, Joanne's young daughter (Chloe Franks) unlocks the door and lets him into the house, whereupon he starts to strangle Joanne to death. Carl Maitland (Ian Hendry) abandons his family to be with Susan Blake (Angela Grant). After they drive off together, they are involved in a car accident. He wakes up in the wrecked car and attempts to hitch-hike home, but no one will stop for him. Arriving at his house, he sees his wife (Susan Denny) with another man. He knocks on the door, but she screams and slams the door. He then goes to see Susan to find out that she is blind from the accident. She says that Carl died two years ago from the crash. Looking in a reflective tabletop he sees he has the face of a corpse. Carl then wakes up and finds out that it was a dream but the moment he does, the crash occurs as it did before. Edward Elliott (David Markham) and his son James (Robin Phillips) are a snobbish pair who resent their neighbour, dust man Arthur Grimsdyke (Peter Cushing) who owns a number of animals and entertains children in his house. To get rid of what they see as a blight on the neighbourhood, they push Grimsdyke into a frenzy by conducting a smear campaign against him, first resulting in the removal of his beloved dogs (one of them came back to him), persuading a member of the council to have him removed from his job, and later exploiting parents' paranoiac fears about child molestation. On Valentine's Day, James sends Grimsdyke a number of poison-pen Valentines, supposedly from the neighbours, driving the old man to suicide. One year later, Grimsdyke comes back from the dead and takes revenge on James: the following morning, Edward finds his son dead with a note that says he was bad and that he had no heart-- the word "heart" represented by James's heart, torn from his body. Wish You Were Here (The Haunt of Fear #22, November–December 1953), is a variation on W. W. Jacobs' famed short story "The Monkey's Paw." Ineffective businessman Ralph Jason (Richard Greene) is close to financial ruin. His wife Enid (Barbara Murray) discovers a Chinese figurine that says it will grant three wishes to whoever possesses it; Enid decides to wish for a fortune; surprisingly, it comes true. However, Ralph is killed on the way to his lawyer's office to collect it. The lawyer (Roy Dotrice) then advises Enid she will inherit a fortune from her deceased husband's life insurance plan. She uses her second wish to bring him back to the way he was just before the accident but learns that his death was due to a heart attack (caused by fright when he sees the figure of "death" following him on a motorcycle). As she uses her final wish to bring him back alive and to live forever, she discovers that he was embalmed. She tries to kill him to end his pain but because she wished him to live forever, every bit of him is alive. She has now trapped him in eternal pain. Major William Rogers (Nigel Patrick), the new incompetent director of a home for the blind (making up mostly of elderly and middle-aged men), makes drastic financial cuts, reducing heat and rationing food for the residents, while he lives in luxury with his dog Shane, a German Shepherd. When he ignores complaints and a man dies due to the cold, the blind residents, led by the stone-faced George Carter (Patrick Magee) exact an equally cruel revenge. After completing the final tale, the Crypt Keeper reveals that he was not warning them of what would happen, but telling them what had happened; they have all "died without repentance". Clues to this twist can be spotted throughout the film, including Joan Collins' character wearing the brooch her husband had given her for Christmas just before she killed him. The door to Hell opens, and the visitors all enter. "And now… who is next?" asks the Crypt Keeper, turning to face the camera. "Perhaps you?" (The earlier Amicus anthology Torture Garden featured a similar ending, breaking the fourth wall). Milton Subotsky of Amicus had long been a fan of the comic book and eventually persuaded his partner Max Rosenberg to buy the rights. The owner of the comic book, William Gaines, insisted on script approval. The budget of ₤170,000 was higher than usual for an Amicus production but was partly funded by American International Pictures. Peter Cushing was originally offered the part played by Richard Greene but wanted to try something different and played the elderly Grimsdyke instead. Filming started 13 September 1971 and finished in 1972. Rotten Tomatoes, a review aggregator, reports that 88% of 16 surveyed critics gave the film a positive review. Roger Ebert gave the film a positive review. Allmovie's review of the film was generally favourable, writing, "It has a certain magnetism about it that is hard to resist and which accounts for its enduring popularity. There's something about Crypt that makes even jaded viewers feel like they're kids sitting in their rooms late at night with the lights out, telling eerie tales with the aid of a flashlight." Vincent Canby of The New York Times wrote that the film lacks style and is too heavy-handed in its morality. Eric Henderson of Slant Magazine rated it 2.5/5 stars and wrote that "the undercurrent of sternness is tempered by a truly bottomless roster of campy excess". Chris Alexander of Fangoria wrote, "[F]rom its first frames to its invasive final shot, this classic British creeper offers an unrelenting study in the art of the macabre." Anthony Arrigo of Dread Central wrote, "The greatest strength in Tales comes not from the acting or directing – both of which are perfectly sound – but in the rich stories culled from the comics." Tales from the Crypt along with the sequel, The Vault of Horror, was released on a double-feature DVD on 11 September 2007. Shout Factory released the same double bill on Blu-ray on 2 December 2014. All Through the House, Blind Alleys, and Wish You Were Here were all somewhat remade into episodes for the Tales From the Crypt television show. Blind Alleys and Wish You Were Here were both changed. Blind Alleys was now Revenge is the Nuts and was about a beautiful blind girl who comes to live at the house, where the sadistic director (played by The Dead Zone's Anthony Zerbe) tries to sexually assault her. In the end, she and the other residents take their revenge on the director in the same fashion as in the original story. Wish You Were Here is similar in to the TV series' 7th season episode Last Respects in that both borrow plot elements from W. W. Jacobs's classic story "The Monkey's Paw" and both are directed by the original film's director Freddie Francis. Like many of the show's episodes, "Last Respects" uses the title of an existing story from the comics (Tales From The Crypt #23), but does not use the story itself. The statue from the film is reverted to the original monkey's paw in the TV episode, and the story now deals with three sisters who come into possession of it. One wishes for a million pounds, and she and the second sister are in a car crash where she dies, and her life insurance policy is for one million pounds. When the third sister wishes that the dead sister was the way she was just before the crash, she learns that she was actually killed by the second sister. In a form of revenge, the third sister gives her last wish to her sister, but she did not say which sister she wanted to give it to, beating the monkey's paw at its own game. The wish is transferred to the dead sister, who comes back to kill the second sister. 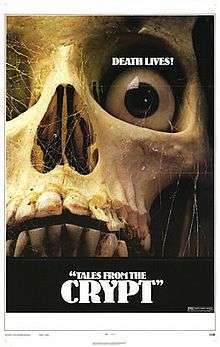 ↑ "Tales from the Crypt (1972)". Rotten Tomatoes. Retrieved 15 February 2015. ↑ "Tales from the Crypt". rogerebert.suntimes.com. 15 March 1972. Retrieved 6 July 2012. ↑ Butler, Craig. "Tales from the Crypt (1972)". Allmovie. Retrieved 6 July 2012. ↑ Canby, Vincent (9 March 1972). "Tales From The Crypt (1972)". The New York Times. Retrieved 15 February 2015. 1 2 Henderson, Eric (30 September 2007). "Tales from the Crypt | The Vault of Horror". Slant Magazine. Retrieved 15 February 2015. ↑ Alexander, Chris (28 November 2014). ""TALES FROM THE CRYPT / VAULT OF HORROR" (Scream Factory Blu Review)". Fangoria. Retrieved 15 February 2015. ↑ Arrigo, Anthony (27 November 2014). "Tales From the Crypt / Vault of Horror (Blu-ray)". Dread Central. Retrieved 15 February 2015. ↑ Galbraith, Stuart (18 December 2014). "Tales From The Crypt / Vault Of Horror (Blu-ray)". DVD Talk. Retrieved 15 February 2015.